A simple catalyst to tackle the problem of creating chiral phosphorus compounds has been designed by scientists at pharmaceutical giant Merck & Co. They went on to use the catalyst to synthesise a promising new hepatitis C drug that is currently in trials and is one of a class of drugs that can cure the disease. Protides such as the hepatitis C drug sofosbuvir (Sovaldi) are potent antivirals. Sofosbuvir cures up to 97% of patients with hepatitis C and is on the World Health Organization’s essential medicines list. Like many biologically active molecules, protides have several chiral carbons, but many also have a chiral phosphorus atom. The phosphorus’ chirality can have a big impact on the protide’s efficiency as a drug. In sofosbuvir ‘the S isomer is five to 10 times more potent than the R isomer in liver cells’, explains Raymond Schinazi, Emory University researcher and founder of Pharmasset (now part of Gilead Sciences), the company that makes Sovaldi, who wasn’t involved in the new work. Chemists have a firm grasp of selectively making chiral carbon compounds, but there are few syntheses for chiral phosphorus centres. 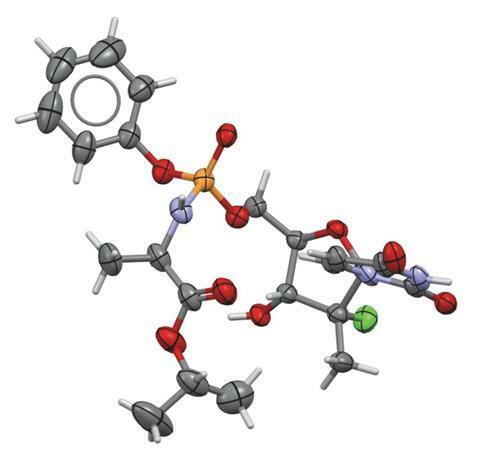 A Merck & Co team led by Daniel DiRocco has now designed a simple catalyst that controls phosphorus’ chirality in protides, which helps them to avoid tricky stereoisomer separations and decrease the amount of by-products. With only 2% catalyst, they made the R isomer of MK-3682 in yields exceeding 90%. MK-3682 is a hepatitis C drug currently in Phase 3 clinical trials at Merck. Instead of coming up with a completely new reaction, DiRocco’s team used an established method – coupling a phosphochloridate with a nucleoside – and set out to find small catalysts that would produce only a single phosphorus enantiomer. They first investigated the reaction’s mechanism and ‘found some interesting kinetic effects, which led to the development of a catalyst that can perform both of the functions that it performs in the transition state – and we put them into the same molecule’, explains DiRocco. A combination of computational design and experimental testing then led them to their biscarbamate catalyst. ‘What I like about this method is that it allows you to make protides the same way you’ve been doing it before,’ comments Youcef Mehellou from Cardiff University, who has been working with protides since 2005. ‘You only need to add this catalyst and it improves the stereocontrol, improves the yield massively and improves the selectivity to the 5’ hydroxyl group,’ he adds. Correction: On 3 May 2017 an error in stereochemical assignment was corrected.